Contact Geli Klause email webmaster-at-panthercarclub.com to place your PCC event on this website. You will find the club code at the members only area! I’m having a Drive It Day around Dartmoor on the 28th April. We start at Yelverton car-park at 1.00pm for a gentle 50 mile drive around the Dartmoor National Park. Going past Dartmoor Jail, Two Bridges, Dartmeet, Widecombe in the Moor, Okehampton and a few other places as well. The finish, at roughly 4.00pm is the Bedford Hotel in Tavistock for a Devon Cream Tea. (£6.00pp) All invited. Please contact the Editor if going. There will be a limit on numbers so get in PDQ! Panther Area 9 Welsh Tour based at the Lake Vyrnwy Hotel & Spa May 14th to May 17th 2019 (3 nights). Due to health related issues we have a cancellation on the trip. Area 9 are pleased to announce preliminary details of our 2019 Tour. Rooms are to be booked directly with the hotel. But please confirm with me that you have done so. You can see that there is limited availability of the Premier Lake View rooms. First come, first served. The Lake View rooms are very nice also. I have stayed in one of the Garden View Rooms, nice and comfortable missing only the view of the lake. We would suggest that we take the Tavern Brasserie on the Tuesday evening and the Tower Restaurant on the Thursday evening for our farewell dinner. This leaves Wednesday evening free. Our proposal is we have a full day out to Portmeirion Italianate Village, taking a two course lunch at Castell Deudraeth which gives us good parking, complimentary mini-bus to the village and free entry. A provisional booking has been made for lunch. We will take a scenic route to and from Portmeirion and aim to be back at our base by early evening. There will be plenty of free time Tuesday and Thursday to enjoy the Spa and Hotel facilities. The walk around the lake is level and quite spectacular. For the petrol heads there are plenty of superb driving roads. We do hope that you can join us . Our first 2019 Area 12 local visit is to Castle Drogo EX6 6PB on the 12th.May. Gather at the ‘Hog & Hedge’ A30 Whiddon Down Services EX20 2QT for 10.30am Castle Drogo is a 1930’s Lutyens design, National Trust owned, and has just completed a multi-million pound renovation to keep the rain out. The countryside around here is beautiful Springtime Devon. The castle has several walks down to and along the River Teign. Contact Andy Graves 01752 778415. Join us for our 2019 International Grand Gathering tour to the Biggest Classic Car Pilgrimage to Europe for the 2019 Circuit Historique de Laon, with over 350 cars attending this event every year. 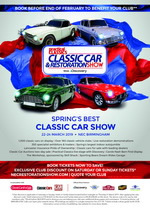 A non competitive event dedicated to any type of vintage, classic, sports and kit car. 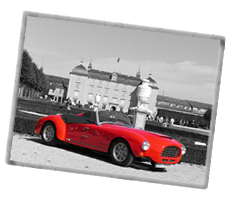 The city of Laon will once again host this classic car parade of classic and vintage cars from all over Europe. ANDY’S PENULTIMATE TRIP TO SPAIN for 2019. “PLAN A” Leave Plymouth on the 16th.June for 2 nights in Avila Parador, 3 nights in Salamanca Parador, 4 nights in Toro and 7 nights in the Del Oso. £1956.80 per couple inclusive of car, Club4 cabin and B&B in all the hotels. (Total including ferry nights, 18 nights at £108.71 per night per couple/£54.35 per person per night). “PLAN B” Leave Plymouth on the 23rd. of June to meet up in Toro on the 24th. for 2 nights and 7 nights in the Del Oso. £1321.60 per couple inclusive of car, Club4 cabin and B&B in all the hotels. (Total including ferry nights, 11 nights at £120.14 per couple/£60.07 per person per night). Return to Plymouth leaving Santander on the 3rd. July. A deposit of £50.00 per person will be required by Brittany Ferries when booking. All the above are inclusive of the 20% discount. I have 7 cabins and hotel rooms on hold with 5 taken. Contact Kathy Venn on 01752 635324 saying you wish to be booked onto Andy’s Panther trip to Spain 2019. Please let me know if you book. I’ll produce a more detailed itinerary early next year. Dates for the 35th edition of the Lancaster Insurance Classic Motor Show, with Discovery, have now been confirmed. Friday 8 - Sunday 10 November 2019! Stay tuned as tickets will be going on sale in May 2019.